A 16-year-old boy is in hospital after being stabbed in a “brutal” attack in Glasgow. Detectives are treating the attack on the teenager in the Baillieston area of the city on Friday as attempted murder. He was assaulted at around 10.30pm after leaving a group of youths in Garrowhill Park to walk to a nearby Spar shop with a friend. The attack happened as the pair walked back through the lane next to Bannerman High School after finding the shop closed. The victim was approached by a young man before he reached Glasgow Road and was stabbed in the ensuing argument. He was taken to Glasgow Royal Infirmary by ambulance where he remains in a serious but stable condition. The suspect, who was around 18 years old and was wearing a dark hooded jumper and jogging bottoms, ran off. Police Scotland want to trace a young woman who was with him at the time. 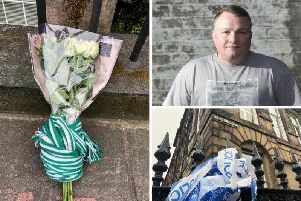 Detective Sergeant Willie Downie from Shettleston CID said: “This teenage boy could have lost his life as a result of this brutal attack and it is critical that we trace the person responsible as soon as possible. “The surrounding area is popular with groups of youths and I would appeal to anyone who was there around the time of the incident to get in touch. “In particular I would like to speak to the young woman who was in the company of the suspect as I believe she may have tried to break up the altercation. “Somebody must know something and anyone with information is asked to contact Shettleston CID on 101.